Welcome to the third day of my birthday week. Do I have a treat for you today! It’s another book giveaway courtesy of my lovely friends at Dayspring. I truly hope you have checked them out and shown them some love for their generous and encouraging spirit. I first learned about Tsh Oxenreider’s new book, Notes From a Blue Bike, last October at the Allume conference. 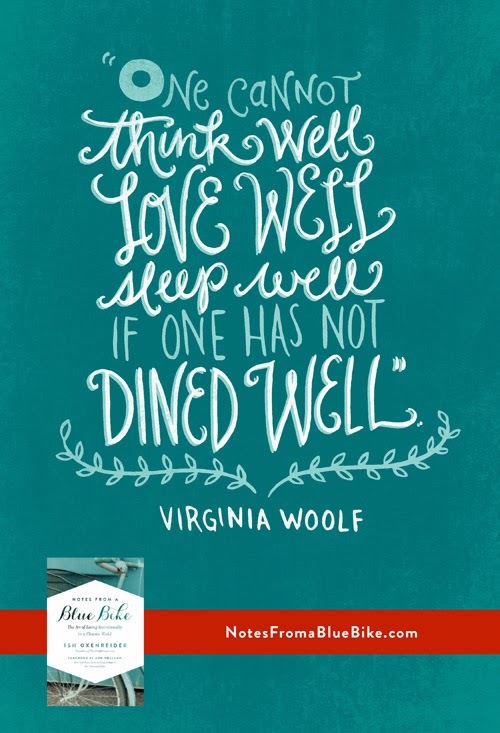 There was a snazzy little fridge magnet in my swag bag with a quote from Virginia Woolf (anyone afraid yet?). Little did I know the impact this book would have on me. It may be the same for you. This year I am trying to live with INTENTION. It’s my One Word for the year and even up there in my header. I lost count of how many times that word is used in this book. That’s a good thing. Whether it is where I live, how I eat, where I go, or how my son learns to read and write, I want to do it all with intention. I want to care for those in my home and those across two oceans. I’m not the only one with this desire and Tsh’s family is an excellent model for me. I am fascinated by the thought of living in another culture and often wonder if I could actually do it. There are so many insights into the daily minutia thoughtfully crafted as story throughout that make it seem doable. House Hunters International never follows up the rental of a fifth floor walk-up with shots of the weekly grocery shopping or the laundry that must get done. Notes from a Blue Bike is divided into 7 specific sections. Five of the seven cover: Food, Work, Education, Travel, and Entertainment. Of particular impact was the section on Travel. I’ve never been a “big” traveler. I’ve done lots of small travel in my life, but “big” has just not happened. I have left the country. Once. We drove to Saint Sauveur, Quebec for vacation one summer from Connecticut. If you can drive, it’s not quite a “big” trip. However, they do speak French there and we do not. It was a wonderful experience and I highly recommend the Laurentians in summer. As I was reading about traveling with children I started thinking about what it would be like for us to travel internationally, or even cross-country with our little guy. Oh, the hours in an airplane! Then it hit me. Our son LOVES airplanes! He also regularly sits strapped in a car seat for 6 ½ hours once a month as we drive home to see family. Before that it was a 12 hour drive from Chicago. He’s actually done quite well on several flights. What was my problem. The food pickiness would be the only problem. Maybe a lack of his comfort foods would be a good thing! All this to say that I just filled out an application for his passport!! Who knows? We may hit the friendly skies to see where Finn, Holley and Mater were trapped inside Big Bentley! Sometimes - most times - being intentional and simple take more effort. That effort is rewarded. I want this life to be a rewarding one. Don’t you? So I’m offering you a chance to win your own copy of Notes From a Blue Bike right here. This is hot off the presses and just released yesterday. If you don’t win, you will still want to get your own copy. You will thank me later. Trust me! I would like to be more intentional in my writing and blogging! Yes, indeed - not about me but others. If we aren't watching we miss those good works laid out for us to walk into. Thanks for stopping by. Love you. Can't wait to read this book!!! I love the premise of this book. I am finding I am having to be intentional is every area of my life, because neglect rides my heels like a dog on a rabbit trail! thanks for chance to win! Shannon, even your comments take me on a journey! That dog lives here, too. Glad you came by! Thanks, it's a big step. Thank you for stopping by! Happy Birthday! It sounds like this book has a great message and some interesting stories! Thank you. I was utterly fascinated by the stories of everyday life in another culture. It's very interesting. Happy Birthday! I need to be more intentional in almost everything. Spending good times with my kids amidst the busy ness of the day is one. Same here. I was surviving so much in the default of whatever happened because I wasn't being intentional. Thanks for sharing that. I want to be more intentional about being present and finding joy in the moment. In my setting aside specific time for specific activities -- like writing, photography, study. I would like to be more intentional in my parenting. Yes, yes, yes... I find I react much better if I have a plan already in place for a variety of circumstances. There is always room for improvement. Thank you! In every way, really. But especially in motherhood, and in being more peaceful and joyful. I think the peace and joy follows when we are intentional in other areas. Thanks for coming by. yes. yes. yes. I want to be more intentional in everything - relationships especially. You inspire me young lady!! Keep that focus on Him and it will not fail you! I'm working on being more intentional in showing love to family and close friends. I want to be more intentional with my teaching and writing. Those are all good areas - showing love is not something that naturally flows from us on a regular basis without the right foundation of love from God. Wonderful! I'm trying to be more intentional with my time...and spend less time wandering the internet! That's a good one! Time is a very limited resource when we waste it so easily. I need to be more intentional in a lot of areas -- cleaning house, spending time with my family, exercising, you name it.